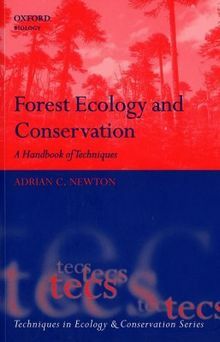 This book describes research methods and techniques relevant to understanding forest ecology, with a particular focus on those that are relevant to practical conservation and sustainable forest management. This information is currently disparate and difficult to locate and, as with other books in this series, the intention is to provide a comprehensive synthesis for use by graduate students, researchers and practising conservationists. Methods are presented for assessing forest extent and condition, structure and composition, and forest dynamics at a variety of scales. Techniques for assessing genetic variation and reproductive ecology, and for evaluating the habitat value of forests are also described. Particular emphasis is given to state-of-the-art techniques such as remote sensing, GIS, computer modelling and molecular markers. However, traditional methods of forest mensuration and ecological survey are also presented. The methods and techniques described are generally applicable to all forest types, including both temperate and tropical forest ecosystems.